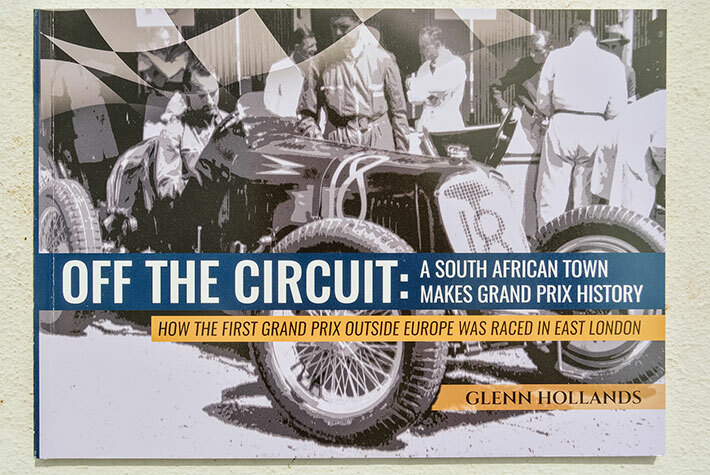 Following is a short synopsis of a new book that has just been released titled Off the circuit: A small South African town makes Grand Prix history. The book was written by Glenn Hollands and is available at the Franschhoek Motor Museum, price R320. When the SA Historic Grand Prix Festival took place late last year, it highlighted the country’s surprising Grand Prix pedigree. In 1934, South Africa not only hosted the first GP in the southern hemisphere, but it did so in the relatively obscure coastal port of East London. The idea that the Fighting Port, as the colonists liked to call it, could host an international Grand Prix seemed bizarre, but this did not deter Edward ‘Brud’ Bishop, the motoring editor of the Daily Dispatch. With the help of a few well-placed overseas motoring connections, Bishop’s optimistic communiqués captured the imagination of young American racer and millionaire Whitney Straight, his brother Michael as well as British racing legend Richard Seaman. Bishop’s dream transformed itself into a motor racing reality. Whitney Straight won the first SA Grand Prix in front of 42 000 local and national spectators, many of whom had camped out at the track. The subsequent pre-war races from 1936-1939 would become part of South African motor racing folklore, during which time the number of spectators nearly doubled. Local hero Dr Mario Massacurati won the 1936 race and in 1937, the Auto Union team stunned the crowds with their raw power. The huge, silver, cigar-shaped cars with their massive 6-litre V16 supercharged engines shredded tyres at such a rate that the German pit crews had barely a moment’s rest. Driven by the famous German racers Rosemeyer and Von Delius, they notched 180 mph on the straight. WW2 interrupted the grand prix momentum but not before East London legend Buller Meyer had whipped local fans into a frenzy with his 1938 victory. The war slowed the rapidly growing motor industry, but its end gave cities like East London an opportunity to exploit the shortage of automobiles by starting up motor assembly plants. The city’s petrolheads hankered after the glory days of the pre-war Grand Prix races but the Prince George circuit, as it had become known, had been swallowed up by industrial growth on the West Bank. By 1950, an alternative race track presented itself in the form of the 1,75-mile (2,8 km) stretch of road along East London’s beachfront that took in the well-known Esplanade and the camping/picnic area known as Marina Glen. Racing began in 1951 with the Winter Handicap races, but the circuit proved to be dangerous. Driven by nostalgia and budgetary considerations, construction started on a safer, much shortened and upgraded version of the original Prince George circuit on the West Bank. The first post-war SA Grand Prix went ahead there on 1 January 1960 with 70 000 spectators in attendance. The 1962 race is regarded as the most important race in South Africa’s GP history as it decided both the drivers’ and manufacturers’ championship. Jim Clark dominated from the drop of the flag but on Lap 61 disaster struck in the form of an oil leak. Graham Hill cruised to victory and the championship win, followed by Bruce McLaren with South African Tony Maggs third. Grand Prix racing continued in East London until 1966 but never really matched the excitement of the 1962 GP.